When Mercedes-Benz took the wraps off the the all-new S-Class little more than a year back, the world stood up and took notice. Like its predecessors, the current model is also the segment benchmark and points out the direction which carmakers should follow. But what about the other cars from the Mercedes stable? Well they obviously benefit since a lot of features and technologies get passed on to the lower segment Mercedes cars. The best example of it so far is the 2015 C-Class. It is the first all-new car that seems to have followed the S-Class' path. This Merc has been eagerly awaited in India ever since it was launched last year in international markets. Despite huge global demand, the C is now ready to roll out in India very soon in CBU form. 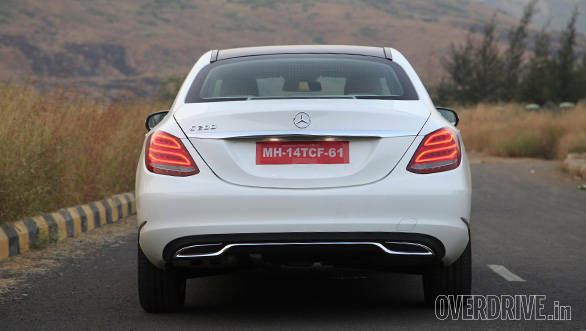 We got our hands on this very model right here in Mumbai and here's what we think of the new generation C-Class. The new C is a baby S - look at the car from any angle and it will remind you of Mercedes' flagship vehicle. The face is now in sync with the rest of the family but she still has an identity of her own. 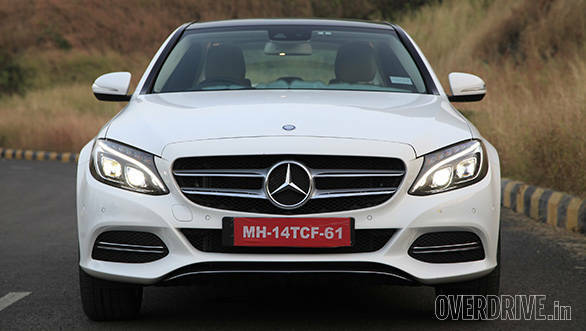 The front grille takes centre stage but the headlamps are sculpted beautifully. Look closely and you'll notice twin projector LED lamps that are circular but surrounded by a unique shape housing like in the S-Class. The day time running lights are striking - in fact the line flows in such a way that it merges with the car's side dropping line. The India spec C that you see here is the Avantgarde line, the front bumper follows a milder approach than the more aggressive and sporty AMG line that is seen internationally but goes well with the rest of the car. The side, unlike the previous C, features a long front end and a rather short rear with an integrated spoiler. The dropping line and the lower character line is also quite prominent, similar to the S-Class. Chrome strips below the doors and on the sides of the bumper add too the elegance but the standard 17-inch wheels could have been more striking. The raised ride height for India is also most prominent from this angle. The overall design and various measures have helped reduce wind resistance and as a result cut through air better to achieve an impressive drag coefficient figure of 0.24. The back, as mentioned earlier, is also very similar to that of the S, especially the attractive LED lamps that stand out when the sun goes down. The exhausts are hidden away below the bumper but the chrome detailing on the diffuser gives it a mock twin exhaust look. Step in and it gets better, the interior is beautifully crafted - one can actually sit inside and spend a lot of time time just looking at the dashboard, the various elements and materials. 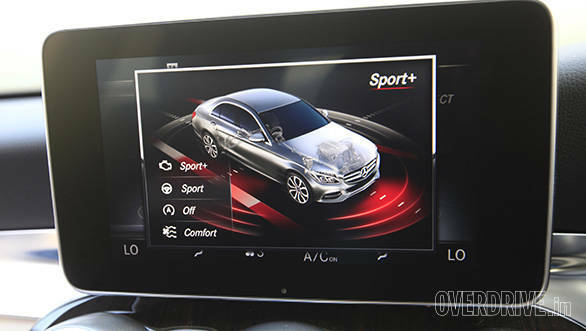 Like in most newer Mercs, there is a slim tablet inspired infotainment screen, three circular vents in the centre and a dual section dashboard. The design is familiar but it's a lot more mature when compared to the MFA cars, the materials used are better and there's more attention to detail, in fact the interior reminds one of the S-Class! The gloss wood inlays and the brushed aluminium detailing for example are very similar, even the metal switches in the centre console and the scroll button feel like they belong to the same parts bin. The Burmester speakers use the same precision cut metal covers, something nobody is used to seeing in this segment. There's even an analogue clock to remind one that it still is very much a C-Class. The large 8.4-inch TFT infotainment screen uses a high resolution screen that displays the latest version of Mercedes' COMAND infotainment system. 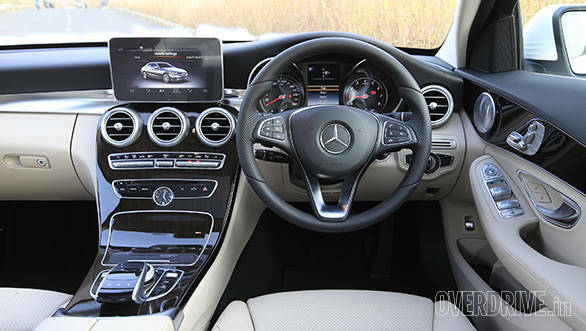 It's a big departure from the system used in all other Mercs, save for the S. The various functions including 3D navigation and car systems can be controlled using the dedicated buttons on the centre console, a rotary knob or the touchpad. All of this will be offered as part of standard equipment in India. 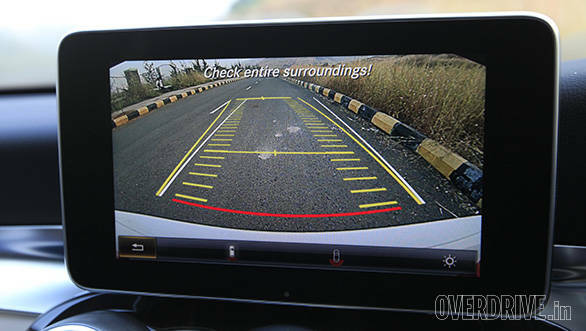 A reverse camera function with two views is a delight to use thanks to the big screen. 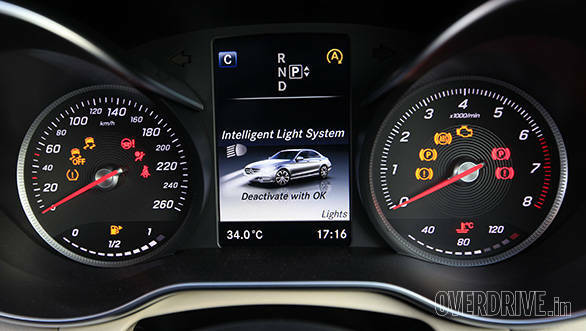 The instrument cluster also features a full-colour hi-res display that sits in between the dials, the colour screen is large and displays a lot of information. 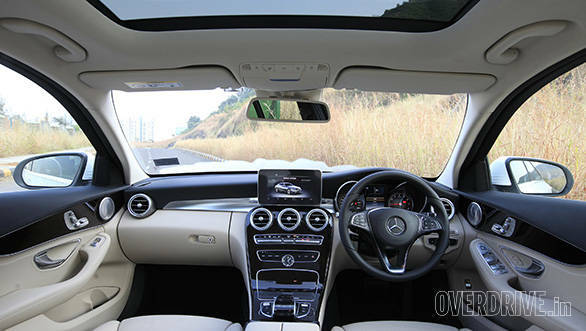 The steering wheel is a new design and will soon be seen in other Mercs positioned below the C-Class as well. So what you get is a better to grip wheel that looks good and even features larger steering controls that are a lot more easier to use than before. And when it gets dark, the standard ambient lighting transforms the car into a mini lounge, you can even choose from three different colours. Has cabin space and comfort improved? The previous C-Class was a comfortable car but wasn't very spacious at the back, but the new car is longer, wider and crucially offers a longer wheelbase too - this helps create additional room. Rear kneeroom has increased considerably, the C is now more spacious than the outgoing model and its German rivals. It is a big improvement and one of the car's strong points. The seats offer better support and are more comfortable. They're also firm so passengers won't complain on long drives. 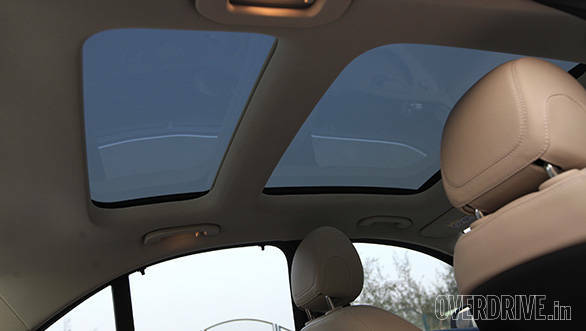 The Avantgarde model also features a panoramic sunroof, resulting in a cabin that feels more airy. There are quite a few storage spaces inside that have been thoughtfully placed. 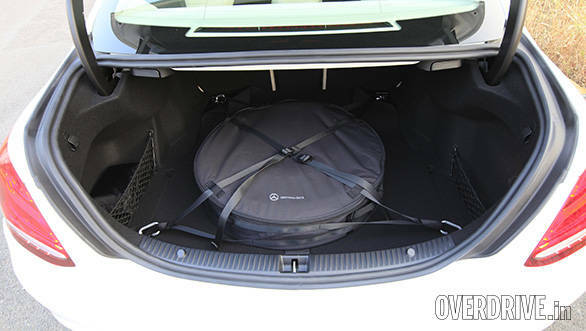 The boot offers decent space of 480 litres but since there is no under boot storage like in the MFA cars, the space saver is placed in the boot. This takes up space and if you need more of it, the wheel will have to be left behind. Loading bay is wide but not as tall as before. The C as of now is a CBU but receives a slight tweak to the suspension setting, the ride height has also increased. Does it affect dynamics? We will come to that later but what's important is that the ride is less stiff compared to the international model. The car is still a lot more firm compared to the previous C-Class but it rides better, even on potholes and broken surfaces. Even as speeds increase, the car feels very confident to drive and stays planted. The C now features an electric power steering, it has been tuned well and feels perfect at slow as well as higher speeds. It's a good balance and is currently the best steering setup we've experienced in this segment, the steering weight can also be changed depending on the driving mode, (more on this below), but even the lightest setting feels ideal for most situations. The car holds its line well at high speeds, it easily is the most involving C-Class ever, the new chassis playing a vital role here. Initially the C-Class in India will only be offered in petrol form, the more popular diesel C 220 should make it here only later. 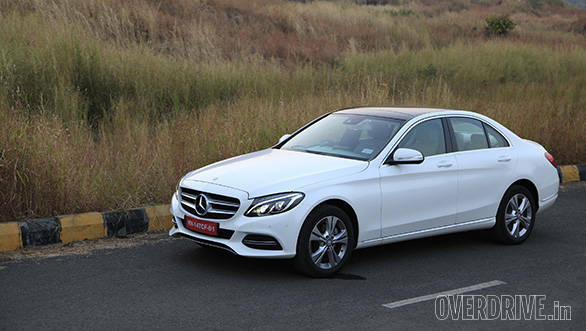 For now, the petrol C 200 will be the only variant available in the country. The four-cylinder 2.0-litre engine produces 184PS at 5,500rpm and 300Nm from 1,200rpm to 1,400rpm, making it the most powerful car in the segment. 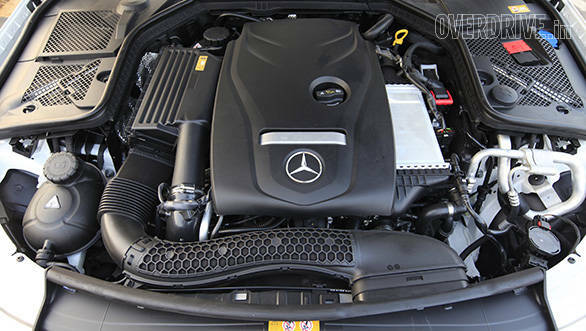 The motor is refined and silent like most Mercedes petrol units - it's mated to the 7-speed automatic transmission. The C however even offers steering mounted paddle shifters as standard. Also on offer are the additional driving modes. One can choose between Eco, Comfort, Sport, Sport+ and Individual. All these modes alter the engine's ignition mapping, steering assistance, climate control and auto start/stop function. If needed, one can opt for a personalised setting using the Individual mode. In Eco and Comfort mode, power delivery is smooth and linear, and best suited to drive in town and cruising on the highway, driving through crawling traffic is also effortless. In Sport and Sport + mode, throttle response is more aggressive and better suited on an open stretch of road or when you need to make quick overtake manoeuvres. The latter mode even adds a little more weight to the steering, but is hardly noticeable. While the car effortlessly cruises at triple digit speeds, outright performance could have been better, Mercedes claims the car can reach 100kmph from standstill in 7.3 seconds. However in the real world, we managed to do the same in a respectable 8 seconds flat. Top speed is a claimed 235kmph but it does take some time to go past 200kmph. Fuel efficiency however is impressive - in town she returned 10.3kmpl while on the highway the figure went up to 16.4kmpl, translating to an overall efficiency figure of 11.8kmpl. The claimed figure is a higher 14.74kmpl. After 2013, 2014 also has been a very busy year for Mercedes-Benz in India - all the new models that were launched this year have been feature loaded. The message is clear, luxury can't be compromised and the same goes with the new C-Class. There is no low spec variant offered. Apart from the features mentioned earlier, the C 200 is also feature laden, safety is priority, so features such as hill start assist and seven airbags are offered as standard. Comfort features like full leather upholstery, panoramic sunroof, driver and passenger electric seat adjust including thigh support, keyless ignition, 3D navigation, ambient lighting, LED headlamps, premium Burmester surround system with 13-speakers (best sounding speakers in the segment) and a lot more features are also offered as standard. 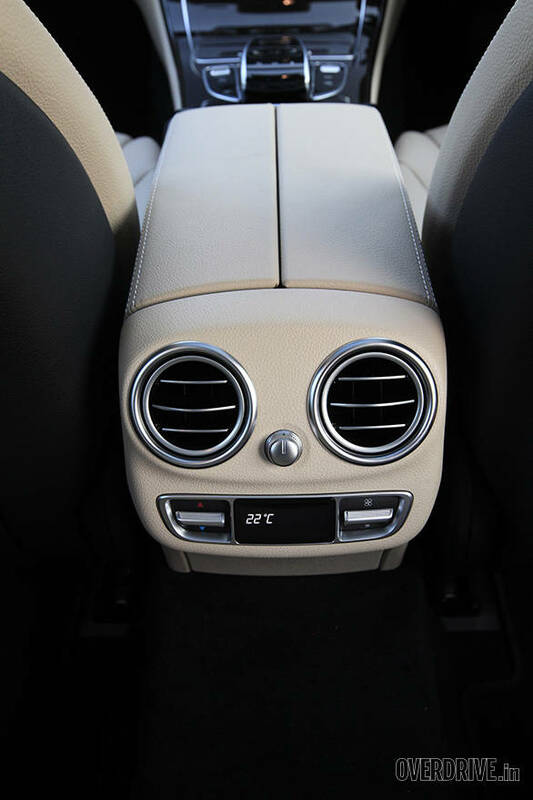 This makes the C-Class one of the most feature loaded cars in this segment. 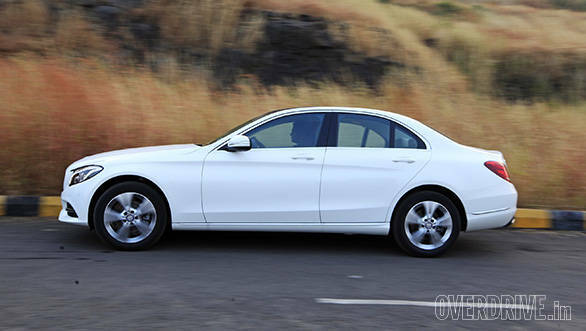 The new Mercedes Benz C-Class is priced at Rs 40.9 lakh (ex-showroom Delhi). The diesel will be launched in 2015, but expect a slightly higher price. At this price, the new C is good value. As you've read here, the car does feel a lot like a baby S and that alone will help boost sales in India. It has also improved in every single aspect when compared to the older model. Over the years, the C did face quite a bit of competition but the new generation car is exactly what we were hoping would be. There is no diesel variant at the moment but once it arrives, competition will definitely begin to worry - we are sure they already are. However unlike the outgoing C that was assembled here, the W205 is being brought into the country through the CBU route. This means the car will come at a slight premium, we expect it to be priced slightly more than its petrol rivals but for the extra premium, you not only get a car that is better in most aspects but one that is loaded with a host of features. The new C is the segment benchmark.